Recent increases in nitrogen (N) fertilizer prices and current expectations about crop prices mean growers should consider reductions in fertilization rates in order to achieve maximum profits. Nitrogen recommendations for maximum crop yield are generally based on yield potential or realistic yield expectation (RYE), which varies by soil type or productivity, climate, and various other soil and crop management factors. However, the N rate for maximum economic yield depends on the fertilizer N cost and the market price received for the crop. Historically for corn, the Crop price:N cost ratio typically has varied from 10:1 to 15:1 (i.e., a 10:1 ratio results from $2.50/bushel : $0.25/pound N). Under this range in price ratios, the N rate for maximum economic corn yield varies only slightly. However, when the N fertilizer price increases significantly and the crop price holds steady, the economic optimum N rate will decrease more. Fertilizer N rates for maximum profit are always lower than the N rates required for maximum yield. The majority of commercial fertilizer N products is manufactured from anhydrous ammonia, NH3, which is produced from reacting N2 (nitrogen from the air) and H2 (hydrogen from natural gas) under high pressure and temperature. Since 1999, the cost of natural gas and other energy sources has increased substantially (Figure 1). There are two primary reasons for the recent increases in energy prices, one short term and the other longer term. Short-term increases are normally the result of significant disruption in production due to political conflicts and weather disasters. In 2005, weather in the Gulf of Mexico was the primary factor. Longer-term factors include a steady and substantial increase in foreign and domestic energy demand and a reduction in domestic oil production and refinery capacity (U.S. Department of Energy, Energy Information Administration, Annual Energy Review). In addition, the U.S. capacity to produce anhydrous ammonia has decreased approximately 50 percent since 1998. 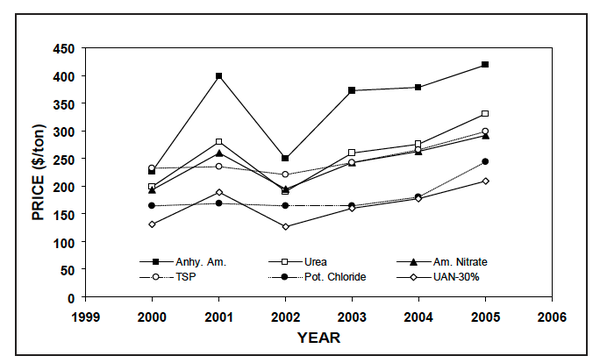 As a result, the price for N and other fertilizers has been increasing, albeit somewhat erratically (Figure 2). Current prices for N fertilizers range from $0.30 to $0.50/pound of N, depending on the source. The main sources are anhydrous ammonia, urea, ammonium nitrate, and urea-ammonium nitrate solutions such as UAN-30; the price per pound of N varies substantially among these sources. Because each source has a different concentration of N, it pays to compare them on the basis of the per-pound cost of N. Anhydrous ammonia contains 82 pounds of N per 100 pounds of product; ammonium nitrate, 34 pounds; ammonium sulfate, 21 pounds; urea, 46 pounds. Liquid N solutions vary but typically contain 28 to 32 pounds of N per 100 pounds of product. Figure 2. Market prices for some common agricultural fertilizers. Key: Anhy.Am = anhydrous ammonia. Am. Nitrate = ammonium nitrate. TSP = triple super phosphate. Pot. Chloride = potassium chloride. Figure 1. 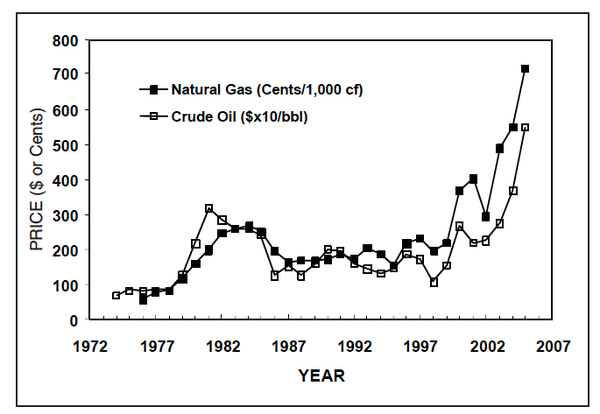 World market prices for natural gas and crude oil, 1972-2005. Key: Natural gas price is shown in cents/1,000 cubic feet, and crude oil price is in $x10/barrel. To determine the most profitable N application rate, it is important to understand the relationship between crop yield and N fertilizer rates. This relationship is called the N response function. Figure 3 shows two examples for corn that represent high and low yielding sites. As you can see, there is some production without any added N. Also, the first amount of N that is added has a bigger effect on yield than the later additions. Each subsequent addition of N produces a smaller yield increase up to a maximum. 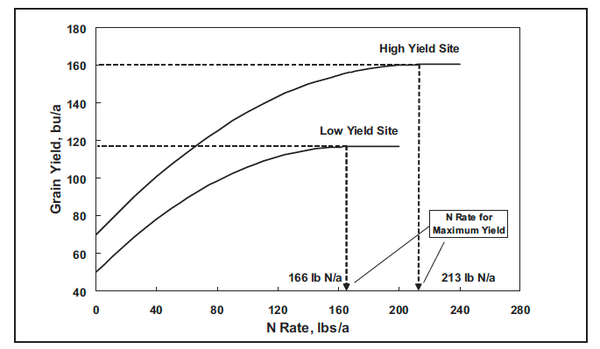 The N rate required for maximum yield represents the point on each curve where no additional corn production is obtained even though more N is applied. For the low yielding site, 166 pounds of N/acre produce the maximum yield of 117 bushels of corn. For the high yielding site, 213 pounds of N/acre produce the maximum yield of 160 bushels. It is important to recognize that, when commercial fertilizer is used, the N fertilizer rate for maximum profit or return on the investment in fertilizer N is always less than the N rate for maximum yield because there comes a point where the value of the additional crop yield will not cover the cost of the additional fertilizer N. This point will vary with N fertilizer prices and the crop price received (Table 1). Historically, Corn:N price ratio generally range between 10:1 and 15:1. The shaded boxes in the table represent the typical historical range in the Corn:N price ratio of 10:1 to 15:1. Table 1. Range in maximum economic N rates for high and low yield sites. 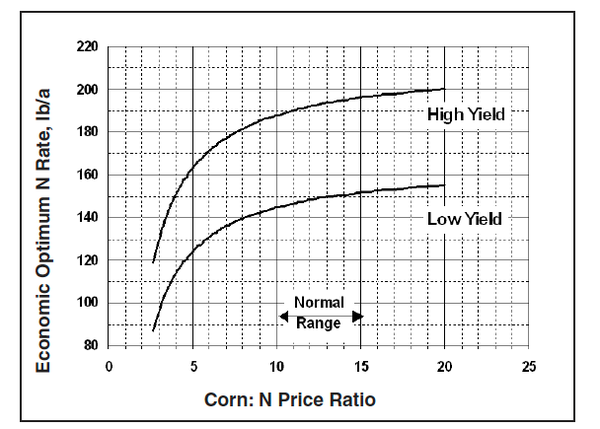 Within this historic range of Corn: N price ratios, the N rates needed for maximum economic yield vary by only about 10 pounds N/acre for the high corn yield site, compared to 7 pounds N/acre for the low yield site. Under these Corn:N price ratios, growers often do not adjust N rates for market price conditions. However, as the N price increases relative to a given corn price, the N rate for maximum economic yield decreases further (Table 1). Under current expectations about corn and N prices for the 2006 crop, the Corn:N price ratio is between 5:1 to 7:1, and the economic optimum N rate decreases by about 20 to 25 pounds N/acre depending on yield potential (Figure 4). This is in close agreement with a recent study in which the average economic optimum N rate across 33 sites decreased from 179 pounds N/acre to 154 pounds N/acre as the Corn:N price ratio decreased from 20:1 to 6.7:1 (Williams, 2005). Careful inspection of Figure 4 shows that the economic optimum N rate decreases much more when the Corn:N price ratio is less than 10:1 than it does when the Corn:N price ratio is greater than 10:1. Therefore, if the N price continues to increase, assuming no change in corn market price, then the Corn: N price ratio could drop below 5:1, suggesting even further decreases in the economic optimum N rate. It is important to stress, however, that these are small reductions in N rates and that more extreme reductions in N application rates will cause large decreases in yield and in profits. Figure 3. Typical corn grain yield response to N rates for low, high yield sites. Figure 4. The effect of Corn:N price ratio on economic optimum N rates for corn at two yields levels. While a reduction in recommended N rate is warranted when fertilizer N prices are high and crop prices are low, growers may see a small reduction in yield under normal growing conditions. This reduction in yield can be minimized by using sound agronomic and N management practices to insure economically optimum yields and maximum efficiency in the use of fertilizer N. Growers must remember that sound fertilizer management considers timing, placement, and source of materials. The RYE must accurately represent the native productivity of the soils under growers’ management approach. Overestimating the RYE will cause the N recommendation to be overestimated also, which will reduce profitability and increase the risk of N loss to surface and ground waters. Underestimating RYE will reduce the profit potential of the crop. Several management practices will influence the uptake of fertilizer N by the crop. Soil sampling and analysis will identify problems with pH or other nutrients that might limit crop development and need to be corrected. Growers should consider split N applications compared to a preplant application of the entire recommended N rate. In many grain crops, split applications can increase N use efficiency by 10 to 15 percent. Under no-till and conservation tillage systems, surface or subsurface N applications may also increase crop recovery of applied N by reducing N immobilization by the surface crop residue. Subsurface N placement may also increase N use efficiency by about 10 percent, but this must be balanced against whether any additional application costs might be incurred. This discussion has focused on the optimum use of N in crop production. However, higher energy prices have also affected diesel fuel prices and many other farm input costs. Rising input costs and flat commodity prices may create a situation where the expected revenue from the sale of the crop will not cover out-of-pocket costs, making a particular field or crop unprofitable. These cost increases may also change the relative profitability among cropping alternatives, creating incentives to change the crop selection or to adjust the crop mix. The overall impact of these changes on the profitability of individual crops should be assessed by developing enterprise budgets. NC State publishes budgets for selected crops, and these can be used as templates for developing budgets for specific farm situations. In summary, economic optimum N rates will be reduced during periods when N prices are unusually high relative to crop prices. However, these reductions should be relatively small compared to the optimum fertilization rates under more typical fertilizer N and crop prices. A small reduction in yield can be expected, but this can be minimized by employing sound agronomic practices. Growers should also evaluate the cost effectiveness of changes in N management practices that will increase the efficiency of fertilizer N use by the crop. Best Management Practices for Agricultural Nutrients, AG-439-20. Soil Tests for Corn Nitrogen Recommendations and Their Relationships with Soil and Landscape Properties. 2005. J. D. Williams. Dissertation. North Carolina State University.